My architecture career started when a classmate in high school accidentally signed me up to be set designer for the school play. It ended up being a happy accident, and I absolutely fell in love with design. I went on to study architecture at UC Berkeley and graduated in 2013. I now work at Christiani Johnson Architects, working on a multi-family affordable housing project in Sonoma. I also just joined the OWA+DP Steering Committee and am enjoying working with such amazing and inspiring women. The Design of Everyday Things by Don Norman (Basic Books, 2013). I just started reading this book, but I already feel like it’s changing the way I interact with objects. Within the first couple of pages, it has already showed me how much can go wrong with designing a door! It also conveys the importance of clear design and creating a system image that the end user will be able to understand. Even though the book is intended more for product designers, it has reminded me of the importance of thinking of the end user for buildings and how they will navigate space. This is a must read for anybody in the design field. I’ve had several mentors through each major stage in my career. My high school tech director for the school play helped me have confidence not only in my designs, but also in myself. When entering college, my family helped ground me and piece my interests together to pursue architecture. Before, I had felt lost and scattered, having interests in what seemed like everything: design, construction, art, structure, technology and so on. It was my family that helped me see that architecture was the perfect merge between all these disciplines. Mentoring is very important for support, which is why I participated in this year’s AIA Mentorship Speedmatch. I’m hoping my mentor group will guide me as an emerging professional, and I am excited to return the favor and become a mentor someday. I know I should probably go with something utilitarian, but honestly if the end of civilization means no more humans, I need to have something that will keep me entertained. Since I love board games, I would probably choose Betrayal at the House on the Hill. This game allows you to build your own haunted house each time, and the story unfolds as you play. No two game plays are ever the same. It would be interesting to see how I could play it as a single player game. I always long to go on more adventures in the great outdoors, so definitely some sort of park ranger. Working in Yosemite would be an absolute dream. I have found so far that the support of my fellow women architects and designers has helped me overcome numerous obstacles in my career. We are more open to collaborating, and help each other in ways that benefit everyone in the field, and overall produce better projects. Personally, I would not be at the level that I am today had it not been for the support of other women. There are plenty of things that we still need to fight for, but in general being a woman and having a support network has helped keep me inspired rather than discouraged. Zaha Hadid’s death, on March 30, has prompted a flurry of responses. Articles have ranged from evaluations of her life and work to reflections on her meaning for other women architects, to more general considerations of the current and historical status of women in architecture. Rather than adding to this growing pile, we have gathered some of the most interesting items for your reading pleasure. The New York Times has been particularly prolific, with writing about Hadid from a number of angles, by a variety of people. Worthwhile articles can also be found in The Guardian, on ArchDaily, and elsewhere. See below for a list. 1. To what extent is the work of women architects evaluated differently by juries, journalists and coworkers? 2. Would it be better to refer to “women architects” simply as “architects?” Does erasing the language help to erase the bias? 3. How much does the break-away success of one member of an under-represented group help lift up the other members of the group? 4. Could Zaha Hadid only accomplish what she did because she was single and childless? How many successful women architects can you think of with children? 5. A related point, raised in the Monocle24 Radio podcast: Does the relatively low pay of architecture cause more women to slip out of this profession than from higher-paying professions where childcare would be more affordable? In other words, how is the impact of your gender framed by economic considerations? 6. Being a woman is only one way we may be non-standard in the world of architecture or the world at large. Hadid is famously quoted describing herself as a “triple whammy: I’m a woman and that’s a problem for some people, I’m a foreigner, and I do work which is not normative, not what they expect.” To what extent can we understand the status of women in isolation, and to what extent is it necessary to consider the intersection of other aspects of identity? The Grand Canyon is one of the best known and most visited national parks in the United States. Perhaps what is less known is who designed the buildings that serve the visitors of this great site. Many romantic, rustic stone and timber structures there look like they could have been built by native pueblo or were there when explorers discovered the canyon. Actually, they were designed intentionally from the 1900s to the 1930s. This romantic style became a trend and is seen in many older national parks, but this style was initially conceived by a woman architect, one who is well known for being unknown. Mary Elizabeth Jane Colter was an architect and interior designer who was born on April 5, 1869, and died in 1958. She was one of the earliest women architects and she pioneered site specific design with her many buildings in the southwestern U.S. The buildings at the Grand Canyon are great examples of this. Early in her career, Colter met the daughter of the founder of the Fred Harvey Company. The founder then hired her to design the Indian Building at the Alvarado Hotel in Albuquerque, New Mexico. This was the start of a 46 year long career with both this concession company and the Santa Fe Railroad. Colter’s designs helped make the newly explored western U.S. accessible to travelers. In the 1870’s, the Santa Fe built its way toward California and the Fred Harvey Company provided restaurants and hotels serving quality food along the way. The Harvey Company first got its start improving lunch rooms at railroad stops. Eventually the slogan "Meals by Fred Harvey" was used to attract travelers as their reputation of serving quality food and service became well known. Colter would be the architect for many Fred Harvey hotels and improvements in the southwest, making travel a civilized pursuit and opening up this area to tourism. She was sensitive to the native culture in the area and she shared her vision of the culture with travelers by designing shelter and services for them. Colter’s connection to the Grand Canyon began before it became a national park, when the Fred Harvey Company built several services along the South Rim to accommodate the growing number of people visiting the rim. In 1901, a new railroad spur line from Williams, Arizona, took tourists up to the South Rim. 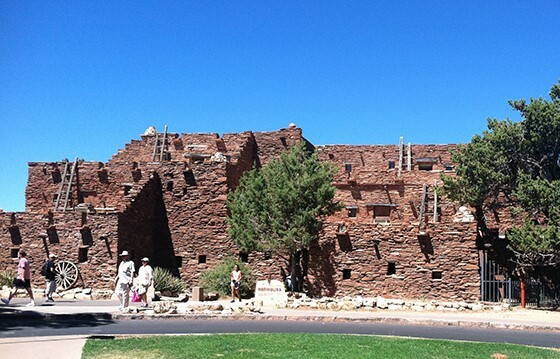 Hopi House, Lookout Studio, Phantom Ranch, and Hermit's Rest were all designed by Colter. They are rustic, built out of local materials, and blend in with the land. The philosophy that buildings in beautiful and dramatic places should have minimal effect on the land was developed by a woman and became the signature style of the era. Mary Colter’s birthday was April 4th. The one day retreat held on March 5 aimed to help members envision and strategize the next stage in the OWA+DP’s development in the context of the theme, “Realizing Our Potential.” Both current and past Steering Committee members as well as officers and founding members attended. Before dividing into groups to discuss these four topics, it was key to frame the discussion within the current context of women in architecture, while also looking back at how the organization emerged in the 1970’s. The main questions that came from this discussion were: how can the organization attract and serve younger women if they do not perceive the need to stand together, and how do we make our group more visible while maintaining an intimate, supportive culture? Discussion of the past and present led into small group discussions on the organization’s future: what should OWA+DP look like by the 50th anniversary? Some groups brainstormed specific actions and strategies, while others tackled questions such as how OWA+DP differs and stands out from other groups. With discussions of past, present, and future in mind, participants identified values, as well as purpose & vision, which were distilled into words and short phrases. These keystones served as guiding principles for the discussion of the four priorities. Collective wisdom – produce a weekly email compendium of events, questions, referrals, jobs etc. Special thanks to Lori Sherman for facilitating this event, Gensler for letting us use their office in Oakland, and the following OWA+DP members for organizing the venue, catering, and facilitation: Gloria Kim, Allison Kinst, Aziza Zare, and Carol Mancke. Design comes alive when it finds its purpose. For as long as I can remember, I have always approached design activity as a communicative strategy. Our built environment has a unique fingerprint that speaks of its residents - their quirks, memories, hopes and aspirations manifested through repeated patterns of creation, use, abandonment, and reoccupation in negotiation with others who call it home, whether permanent or temporary. The increasing complexity of the world we live in today challenges us to question the relevance of professionals at large. Those of us at the OWA+DP are part of one such collective with shared interests, values and identity. But lest we forget, professionalism in architecture is also a 19th century concept born out of the need to distinguish the master craftsperson from the everyday tradesperson. Fast forward to today, being an expert is no longer what it used to be. In a digitally-savvy culture that eschews professional advice in favor of instant, personalized solutions based on big data and complex algorithms, it's tempting to declare defeat and let artificial intelligence run our lives. But for just a moment let's resist the market logic of what we, the invariable consumers of technology, ought to do. The original goal of automation was to bring simplicity to our lives so that we could spend the extra time relieved from the everyday drudgeries to focus on what matters most, such as engaging in deeper conversations with peers and spending quality time with family. For the most part, the goal remains the same. As it turns out, local communities play a pivotal role in the sustainable development of cities, and this is particularly visible after major disasters and events that disrupt the urban routine. The need for communities to be active agents of resilience has never been more urgent, as the world becomes more urban and interconnected through trade and technology but equally through shared recognition of climate change and the need for environmental stewardship. Disasters provide a context for understanding the fundamental values of society affected by crisis. What happens when the power goes out? What do you do when automation comes to an abrupt end? The answer may be to have another look at the enduring value of professionals like architects and designers - indeed, many would argue we ought to use every opportunity to be more proactive in self-promotion rather than self-deprecation. But I would argue that our best bet is to invest in building better relationships, whether it is with our neighbors, civic leaders, peers, and even children, because resilience is measured by the collective ability to respond to a problem, big or small, and the more perspectives we introduce into it the better chance we have for coming up with a feasible solution. As we often hear from environmentalists: whatever we have designed to fail, there is a way to design ourselves out of it. That said, in rebuilding our cities after a disaster, building professionals can contribute to this dynamic by brokering vital stakeholder relationships. For the design profession in particular, the prevalence of urban disasters today presents a new challenge whereby the traditional definition of client and designer’s scope of work ought to include the wider public. 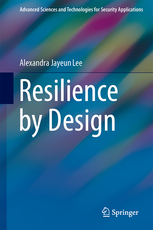 Resilience by Design was written with today's urban citizen designers in mind. In this age of complexity, we not only need a strategy for how to best harness new technologies that can beckon us to lower our guards against the unknown, we also need a strategy for how to thrive and maintain our joie de vivre in their complete absence. I am soon moving from Auckland, New Zealand, to Melbourne, Australia, where I will be 'honorary professorial fellow' in the Faculty of Architecture, Building and Planning. Before retirement, I was Professor of Sustainable Design at the University of Auckland, and prior to that Professor of Architecture at Queensland University of Technology. I visited OWA in about 2001 and I would love to hear from OWA people, especially those I knew from 1973–80. Drop by when in Melbourne. Golden Associates is delighted to announce that we have expanded our geographic reach to Arizona and Colorado and have named Doug Craig, PLA, to principal-in-charge of our Mesa Office. Mr. Craig has more than 30 years of landscape architecture and planning experience in a variety of private and public sector projects including resort and hospitality, retail, healthcare, higher education, and recreational and community parks. Doug is a seasoned professional with professional licenses and work experience in both Arizona and Colorado. Doug is a great addition to our team and is the seasoned leader who can manage that growth for us and continue to provide our clients with high-quality innovative and sustainable solutions that create a memorable sense of place. We hope you will all get involved, come to events, and get to know your fellow members. We also thank everyone who has renewed their membership (47 of you in the last two months). If you haven’t already renewed your membership for 2016, please login to the website and do so. We’ll also have our Square at the Galen Cranz talk in May, so bring your credit card if you prefer paying that way. Worried layering of membrane, shingle, flange. Every instance where up meets over.